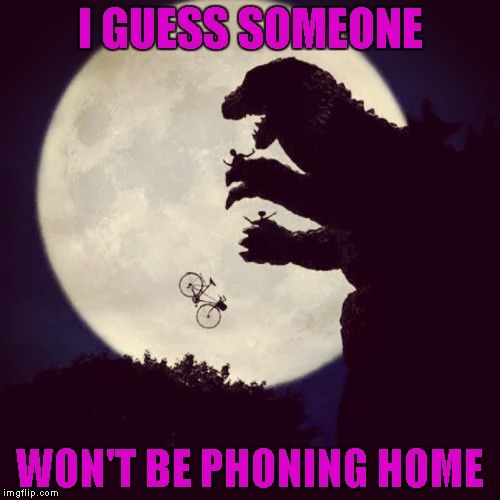 Someone should have told ET and Elliot that Japan was a no fly zone. How 'bout the pagoda house? Cool image in lots of ways. Thanks. I like this template, but not always easy to make it work. Did he say extra testicle on the side? I dont speak Rasta monster. With 3 testicles one would mean it literally if they said Godzilla had balls. Omg. The thing their riding on is so ADORABLE!!! We deny the sequels. We just don't talk about the cartoon series. Ever. Wow, yes you should watch that movie, I made sure my kids did lol. It's from a book called "Die Unendliche Geschichte" by Michael Ende. You probably know it better as "The Neverending Story". You're looking at Fuchor/Falcor. He's the Luckdragon of Fantastica. He likes to be scratched behind his ears. 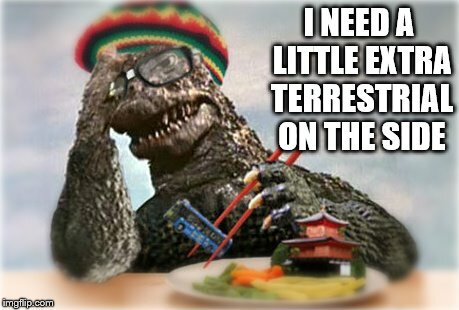 What does Godzilla smell like, nuked? Blechhhhh!! Ha ha. My childhood is now without hope. 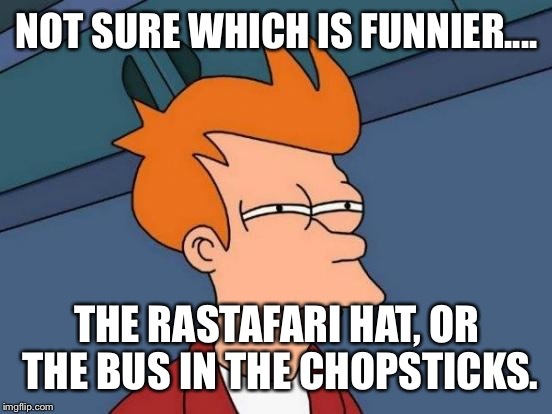 Thank you Bro...I got the same laugh from your meme... imgflip.com/i/y9dgm . Elliot: "I'm flying! I'm flying!" Me: LMFAOOOO, at this awesome meme and myself. Upvote. this is half dark and creepy, half completely hilarious. Wait .isn't that bad luck brian and the rock in that cab? I have that pic with the alien facing Elliot and I have no idea what to do with it. I don't know. Maybe some kind of weird Valentine's Day tie-in? Lol. Not that you need my help coming up with ideas for memes lol. You seem to have plenty of that. You haven't done a "if you watch a movie backwards" meme yet have you? I don't think I've seen one.